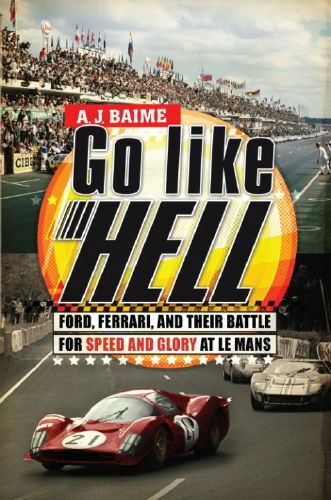 The Carroll Shelby Foundation is offering 66 signed copies of “Go Like Hell – Ford, Ferrari, and Their Battle for Speed and Glory at Le Mans.” The critically acclaimed book tells the remarkable story of how Carroll Shelby helped Henry Ford II, Lee Iacocca and the Ford company defeat mighty Ferrari at the 24 Hours of Le Mans. Each copy being offered by the Foundation has been signed by Carroll Shelby and the book’s author, A.J. Baime. The books cost $225 each, with all proceeds benefiting the Carroll Shelby Foundation, which provides financial support for children to help overcome life-threatening health issues and promotes continuing education. The signed books are available at CarrollShelbyFoundation.org or by calling (310) 327-5072. In my opinion it would be difficult to get your 2009 purchase price for this book. Although the GLH book is a good read there just isn't much demand for that book. Kind of like autographed SAAC Registry books, they just don't sell for much as there is no demand. You also have to keep in mind that although the Foundation said they are selling just 66 signed copies of the book how many Shelby enthusiasts sent their own copy of GLH to the Foundation for an autograph which means there could be many more autographed copies out there. You could always put it on ebay with a fixed price of what you paid but it might just sit there unsold. Perhaps I'm wrong on that. I would like to be more optimistic but am just going by what we've seen in the past with autographed Shelby books. Now if you had an autographed GTH or SGT book from that same time-frame you would be in a much better position because of the demand for those books. Best of luck on the sale and perhaps someone from TS has been looking for this item. Let's hope I'm wrong on my assessment but for some reason Shelby autographed books & Hot Wheels just don't seem to be in demand. Wasn't this GLH book going to be made into a movie? Maybe if a movie is made it would increase the interest in the book. Or was a movie already made from the book and I'm just not recalling it? You might also want to consider that people were willing to pay $225 originally because the money was supporting the foundation and that made them feel good. There's no additional motivation in putting $225 or more in your pocket. One other consideration is the massive number of items that CS signed for years for fans before the Foundation and than after the Foundation was started. He used to go into the office and sign posters and collectibles by the hundreds every week. At shows, I assisted him on a number of occasions during his signing hundreds of items for hours. He loved the fans and relished raising funds for the Foundation. There are a few people that now that never had the opportunity to acquire a signature or even meet him, so there might be a small market for the new collectors. Best offer on eBay is probably the best way to go. I never got to meet Carroll Shelby but wish I had. I realize that many never met CS, especially those that desired to meet him after purchasing something more affordable with his name, like the 2007-2014 Shelby GT500 (over 45,000 produced). But considering how much he was available to fans around the country and the quantity of signed items that he did for decades, the CS signature is not rare by any means except maybe to a few specific items like this book. My estimate would be that it is worth what a collector will pay for this specific item so auction would be the best bet. 45,000 Shelbys GT500s arent that many. They made over 20,000 1969 Z/28s. I owned a 66 GT350 and wanted a signature ....going to a good cause. We cant all own cobras. I am just agreeing with Steve's previous comments about the sale. There are some CS signed items that command some much larger money due to the demand for certain specific items. This might be one to a collector of early CS memorabilia. But I have not seen that demand of late. I am just agreeing with Steve's previous comments about the sale. There are some CS signed items that command some much lager money due to the demand for certain specific items. This might be one to a collector of early CS memorabilia. But I have not seen that demand of late. The desirability of autographed Shelby memorabilia can be all over the place. I'm still amazed how little demand there is for an autographed 1957 Sports Illustrated with Carroll on the cover but put an autographed GTH book on ebay and you can start counting the money being bid. I just looked on ebay and you can purchase an autographed sun visor for $5,000 but just three auctions below that you can purchase an autographed Shelby Hero Card for $40 so obviously one seller is trying to cash in and another seller is selling for less than what the Foundation charged for an autograph. Like I said, prices can be all over the place. They made over 20,000 1969 Z/28s. Don't see many signed Z/28 dashes or photos. Don't see many Shelby signed Z/28 dashes or photos.